Logo-style BirdWatcher text to simply state your favorite hobby. Go out and watch your birds! You don't have to be in a group, you can do it on your own! 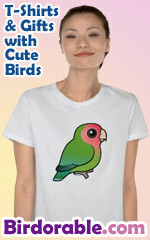 A great gift for all BirdWatchers.